As vital as air and aviation interdiction is to the mission of keeping U.S. borders safe, marine and sea-going interdiction are just as important. With so many of the borders of the United States defined or surrounded by rivers, lakes, and oceans, U.S. Customs and Border Protection Marine Interdiction Agents have a unique and important opportunity to earn a great salary while making a difference for their country. The Office of Air and Marine within the U.S. Customs and Border Protection claims to be the largest air and marine law enforcement agency in the world. With more than 300 vessels, Marine Interdiction Agents make up a large portion of that force and play a big part in the CBP's mission of maintaining safe and secure borders. 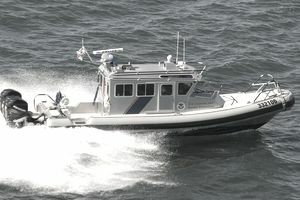 CBP Marine Interdiction Agents are specially trained federal law enforcement agents who operate on boats and ships. They investigate and interdict - or intercept - dangerous people, vehicles, and materials to keep them from entering the U.S., to enforce immigration and trade laws and to support counter-terrorism efforts. The main enforcement focus areas for Marine Interdiction Agents are illegal immigration, drugs, weapons, counter-terrorism, and anti-smuggling operations. These agents spend their days on vessels around the U.S., on the oceans, rivers, and great lakes. Because much of the job is spent on water, agents have to be ready to face all sorts of dangerous and uncomfortable conditions, including large waves and surf, bad weather, dark nights on the water and even high-speed and potentially dangerous boat pursuits. Depending on what level of the federal pay scale you are eligible to be hired at, you can earn between $50,000 and $90,000 base pay, not including federal health care benefits, law enforcement availability pay, or locality pay. To be eligible for hire as a marine interdiction agent, you must be less than 40 years old unless you have prior military or other federal employment experience. You must hold either a Master's License, Operator of Uninspected Passenger Vessel license, or a Deck Mate's license, all issued by the United States Coast Guard. You are also required to have at least one year of prior law enforcement experience, which means you must be eligible to meet the minimum qualifications to become a police officer. It also means you need to complete a police academy, get hired, and complete at least your first year on the job as a police officer before you can even apply to become a marine interdiction agent. Once you've applied, you need to be able to pass an extensive background investigation that will include a polygraph exam. That means you need to keep your background clean and avoid common mistakes that can get you disqualified, such as drug use and other criminal behavior. U.S. Customs and Border Protection's Marine Interdiction Agents have unique, fascinating, and very exciting jobs supporting their agency and the Department of Homeland Security's mission of domestic security. If you enjoy working on the water and are looking for an opportunity to serve your country, a job as a marine interdiction agent with the CBP is likely a great career choice for you.